Vanillylmandelic Acid (VMA) ELISA Assay Kit | Eagle Biosciences, Inc. 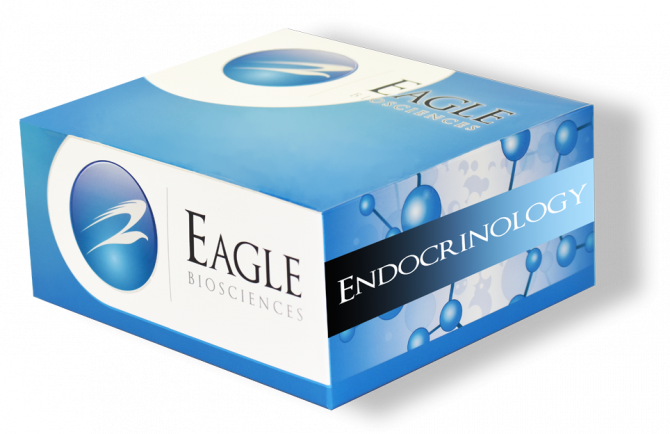 The Eagle Biosciences VMA ELISA Assay Kit is intended for the quantification of Vanillylmandelic acid (VMA) in urine samples. The VMA ELISA Assay Kit is for research use only and should not be used for diagnostic procedures. Catecholamines include dopamine (found mostly in the central nervous system), norepinephrine (mainly in the sympathetic nervous system) and epinephrine (mainly in the adrenal medulla). They are stored as inactive complex. Released catecholamines, having a short half-life, are taken up by sympathetic nerve endings, or metabolized by the liver and kidney and excreted. Vanillylmandelic acid (VMA) and 4-hydroxy-3-methoxy-mandelic acid (HMMA) are the end product of both epinephrine and norepinephrine catabolism. Quantitation of the acidic metabolites has long proven to be a reliable diagnostic as well as commonly used follow-up procedure for pheochromocytoma and other catecholamine-, producing tumors (14-16). The prevalence of pheochromocytoma is 0.1% to 0.2% of hypertensive patients (17, 18). Pheochromocytomas have a long record of misdiagnosis due to the metabolic, cardia and gastrointestinal symptoms that can mimic many other diseases. Undetected, or mistreated it can be fatal. However, since this is a surgically curable disease, early diagnosis by demonstration of excess VMA excretion is critically important. The Eagle Biosciences VMA ELISA Assay Kit is an Enzyme Immunoassay for the quantification of Vanillylmandelic acid (VMA) in urine samples. This assay employs the competitive quantitative enzyme immunoassay technique. VMA antigen has been pre-coated onto a microtiter plate. Standards or samples are pipetted into the wells together with HRP-conjugated anti-VMA monoclonal antibody. Standards or samples and the solid phase bound analytes compete for a fixed number of antiserum binding sites. After washing away any unbound substances, a substrate solution (TMB) is then added to the wells and color develops in inverse proportion to the amount of VMA in the standards or samples. The color development is stopped by the addition of acid and the intensity of the color is measured at a wavelength of 450 nm ±2 nm. The concentration of VMA in the sample is then determined by comparing the O.D of samples to the standard curve. Remove excess microplate strips from the plate frame, return them to the foil pouch containing the desiccant pack, and reseal it. Add 50 μl of standards and diluted samples in duplicate into wells. Add 50 μl VMA Antiserum into all wells. Mix the plate by moving it back and forth slowly for 1 minute. A plate shaker can be used for this purpose too. Incubate the plate without shaking at RT for 1 hour. Aspirate each well and wash, repeating the process 4 times for a total 5 washes. Wash by filling each well with Wash solution (Saline) using a squirt bottle, manifold dispenser, or autowasher. Complete removal of liquid at each is essential to good performance. After the last wash, remove any remaining Wash solution by aspirating, decanting or blotting against clean paper towels. Add 100 μl of TMB Reagent to each well. Incubate for 25 minutes at room temperature in dark. Add 100 μl of Stop Solution to each well. The color of the solution should change from blue to yellow. Read the OD with a microplate reader at 450 nm immediately.